While training to fight and compete may have similarities, there are also big differences in the potential responses needed for a fight versus match. 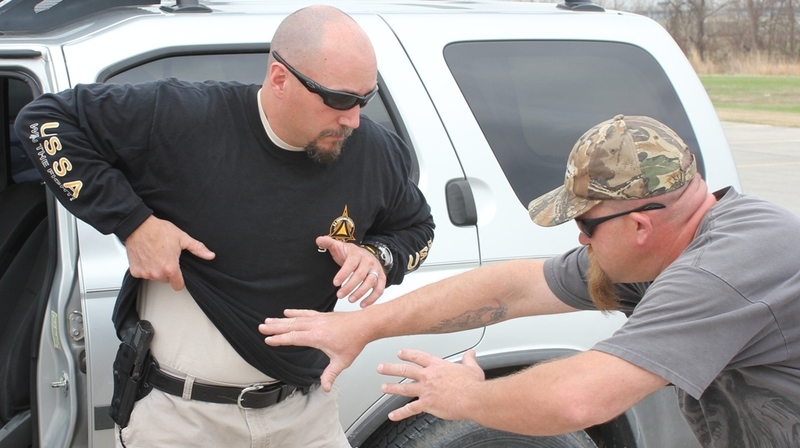 This photo depicts the defender trying to draw the gun while too close to the attacker. individual that always looks at shooting related training in a unique manner. So in this post I will explore the difference, as well as the unique similarities of training to fight and training to compete. Let’s define what I mean by training to compete. I am referring to training for shooting or fighting related competitions. Training to fight means that the training is directly relevant to direct combat with another person. A similarity between the two means that the training component and focus in training to compete would have cross-relevance to shooting or fighting techniques usable in the real world. I decided to write this with a comparison in both the shooting and fighting arenas. So in this post, I figured that I would address each area in a table and try to break down overall similarities and differences. Hopefully those of you that are potentially training for both will be able to use the information to enhance your own training by adding or subtracting components that with help or hinder your training (practice). I strongly recommend that you do some serious analysis when you are looking at your own training and try to figure out how to best match up the drills you are doing with the end result you wish. I want you to be the best in both areas if you are training for both, and the truth is that you each requires some different approaches to be as successful as possible. In the areas where you can cross-train skills that are applicable in both, drive on. In areas where you will need to make changes, then do so. Be especially cautious of bad habits you might acquire with improper training focus, and remember that a failure to pay attention to those habits can cost you greatly if you are training to fight! The following table will show some of the differences in training for the two different environments. Rules Different Training techniques are limited b y the rules. In real fighting, there are none. In competitive fighting, MMA being the best example, there are rules. Even in the first UFC’s, there were some rules that kept the competitors from killing each other. Targeting Different While some targets are similar, training for a real fight should consist of targeting highly effective areas such as the eyes, throat, groin, temples, back of the head, etc. Most targets that are highly effective in a real fight are prohibited in competitive fights. Aggression Different All competitive fights have referees. Real world fights do not. Real world fight training should focus on recognizing when an opponent is faltering, and attempting to kill or seriously maim them at that time. Competitive fights have a referee that will stop the fight anytime a competitor does not have the ability to protect him or herself. Strikes Similar This one was close. As I analyzed it, I came to the conclusion that most strikes are somewhat similar, except for a certain few (such as an eye gouge). A punch is a punch, a kick is a kick, and an elbow strike is an elbow strike. There are some noted differences though, and those are mainly the targets struck. Additionally, most competitive punches are thrown wearing some sort of glove, or padding (which believe it or not is more responsible for protecting the striker, than the strike). Fitness Different This one was close, but upon more inspection I feel that while training could be pretty close, it is different enough to weight me in that direction. The reason for this is that almost all competitions have a set time limit or round that dictates the fight. When the bell rings, the competitors get to rest and recover. Because of that, they often times get to pace themselves more during the actual fight. A real fight is different, and probably requires a much higher tolerance for maximum exertion and heart rate for shorter periods of time. Most real world fights are fast and furious and over quickly. Training for the real world would be best served by doing short, intense intervals with shorter rest times in between. SHOOTING IN A MATCH or a GUNFIGHT? Rules Different There are no rules in a gunfight. There are in competitions. Training for a shooting match should result in being able to apply skills that will increase your score in relation to the rules. Training for a gunfight should focus on employing techniques that help you shoot someone faster, while not getting shot (if the shooting is imminent and unavoidable). Marksmanship and Manipulation Skills Similar This is one area where the training is relatively similar. When training for a shooting match, the goal should be to increase the speed and accuracy that a given target can be hit in a variety of circumstances. Those skills are directly usable in a gunfight as long as you do your research and have an understanding of the potential side effects you may experience that will change the way those skills are applied. An example might be the visual distortion you might experience that would prevent you from focusing clearly on the front sight of a handgun in a fight due to stress and adrenaline (although I have spoken to several gunfighters that have stated they relied on a clear front sight focus to hit their attacker). Generally speaking though, increased marksmanship and manipulation skill can be obtained through similar training. Gear Different Training for a handgun match and gunfight are generally very different in terms of the gear used in each. The bottom line is that the gear that will be used in each should be trained in each. Don’t confuse gear used in competitions such as I.D.P.A. (International Defensive Pistol Association) as something that most people will use in the real world, as often times it is not. I disagree that there are no rules in a gunfight. The 4 firearm safety rules still apply and must be adhered to or someone may be unintentially hurt. This article better explains what I mean. There’s a lot of crossover between the two, the biggest being the ability to quickly get shots on target. I’ve never had much respect for the fly by night defensive trainers who claim to have a “system” that they teach. This kind of snake oil takes me back to the bullshido artist of the 80’s and their McDojo martial arts scams. I’ve always criticized defensive trainers who won’t put their skills to the test in competition. While IDPA and USPSA have 80+ pages of rules, in the end it comes down to fundamentals and quickly getting shots on target.